An ingeniously layered narrative, told over the course of one week, Eddie Joyce's debut novel masterfully depicts an Italian-Irish American family on Staten Island and their complicated emotional history. Ten years after the loss of Bobby -- the Amendola family's youngest son -- everyone is still struggling to recover from the firefighter's unexpected death. Bobby's mother, Gail; his widow, Tina; his older brothers Peter, the corporate lawyer, and Franky, the misfit; and his father, Michael, have all dealt with their grief in different ways. But as the family gathers together for Bobby Jr.'s birthday party, they must each find a way to accept a new man in Tina's life while reconciling their feelings for their lost loved one. In unflinching but lyrical prose, Joyce shows us one mother's struggle to keep her family together and preserve the memory of her son. 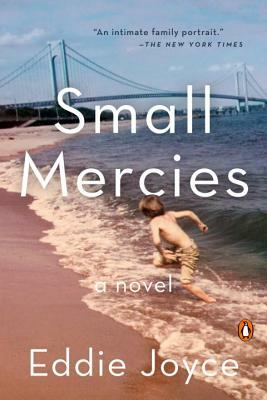 Following Gail as she moves from the corner offices of white-shoe Manhattan law firms to the blue-collar gin mills of the outer boroughs, Small Mercies reveals a different New York, one that exists in the hearts and minds of its inhabitants. Presented through multiple points of view, Small Mercies explores the conflicts and deep attachments that exist within families. Heart-wrenching and profoundly relatable, Joyce's debut is a love letter to Staten Island and a deeply affecting portrait of an American family.